*Our visit to Palm Springs was hosted in part by the Hyatt Palm Springs, and our views expressed here are, as usual, our own. I’ve been visiting Palm Springs since I was 14 years old. Believe me – that spans many years, tons of good times and a LOT of visits. Now continuing those fun adventures with my own family, we’ve stayed in many different parts of the Coachella Valley. We are convinced that Downtown Palm Springs is a great destination with kids. After a gazillion visits since the girls were babies, we’ve instilled this same love for Palm Springs in Sophia and Ava. They beg to drive over from San Diego for the hot desert sun, cool swimming pools, date shakes and warm nights outdoors. One of the big draws for them is the downtown Palm Springs area, because there is so much to do, see, eat and explore. Everything is located in an area we can easily walk (or drive when we’d rather ride in air-conditioned luxury). The Hyatt Palm Springs is located smack dab in the middle of all the action of downtown Palm Springs. 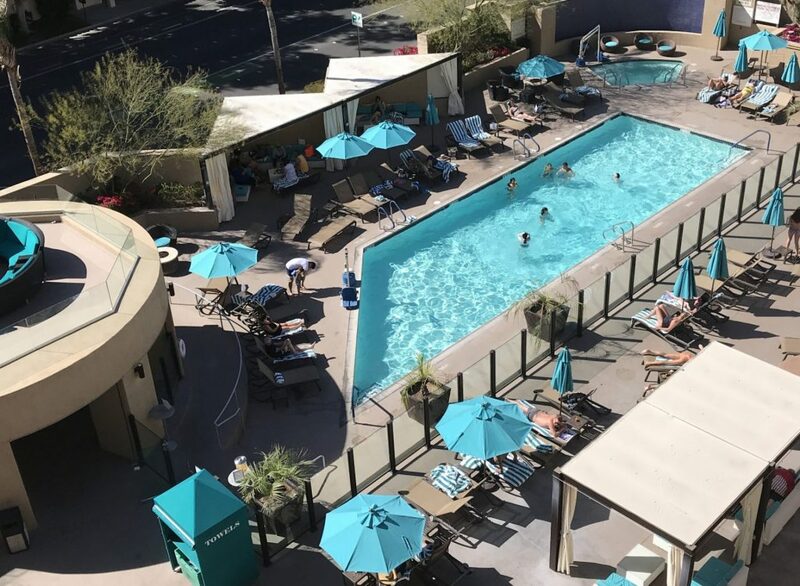 We recently had the opportunity to stay at the Hyatt Palm Springs, right downtown on East Palm Canyon Drive in the heart of Palm Springs. Our experience was awesome because we were right in the middle of it all. 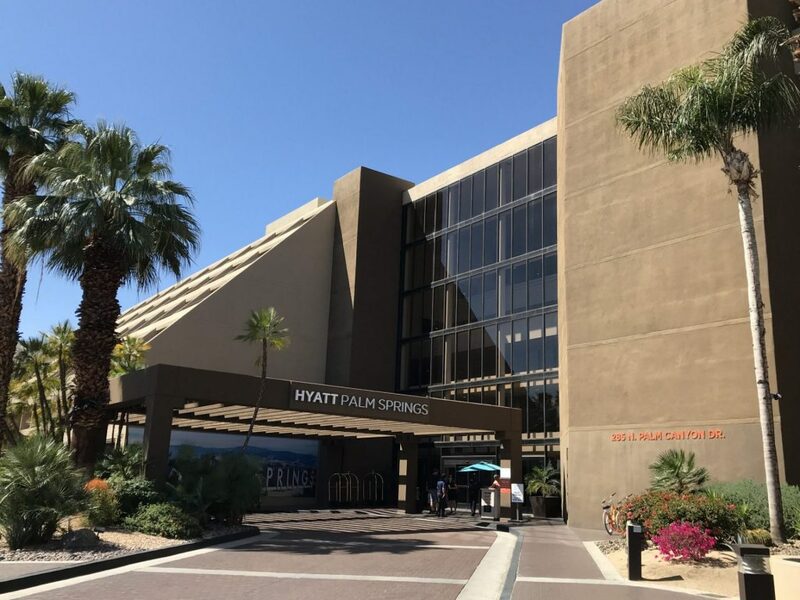 With so many activities, great restaurants and shopping right outside the front door of our hotel room at the Hyatt Palm Springs, we could easily have parked the car for the weekend and never seen it until time to go home. 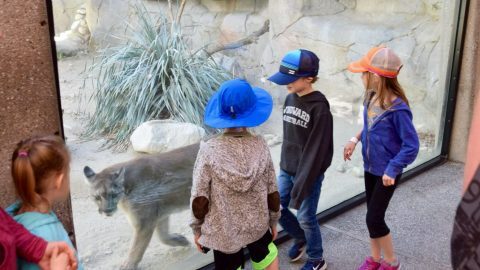 Here’s a sampling of why our family thinks Downtown Palm Springs is a great destination with kids. 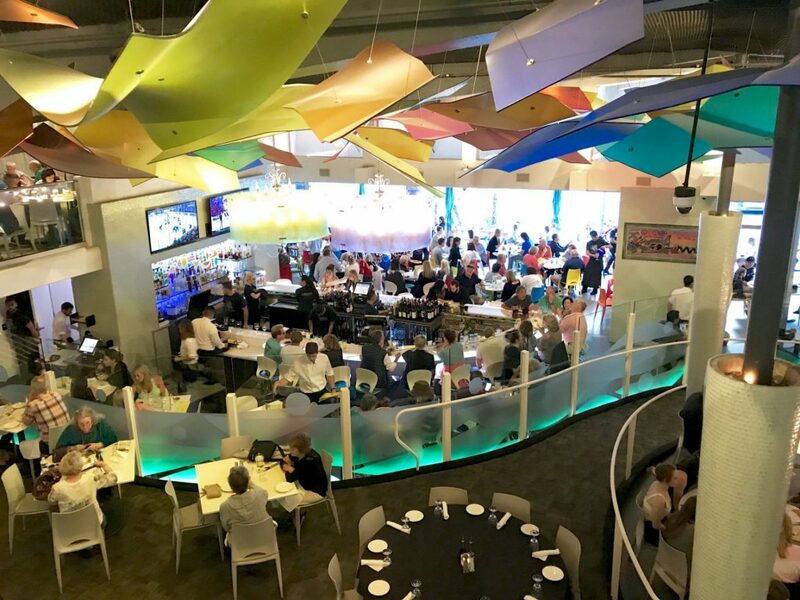 Three levels of dining at Lulu California Bistro allow for plenty of colorful people watching! Downtown Palm Springs is so walkable, we never had to get in the car to head out for a meal. This is a huge plus especially for families with stroller-age kids. Though our girls are much older now, we can still remember the packing up, buckling into carseats and folding strollers into the back of the car. Here, we were able to walk outside and choose from any number of restaurants within a five minute walk. 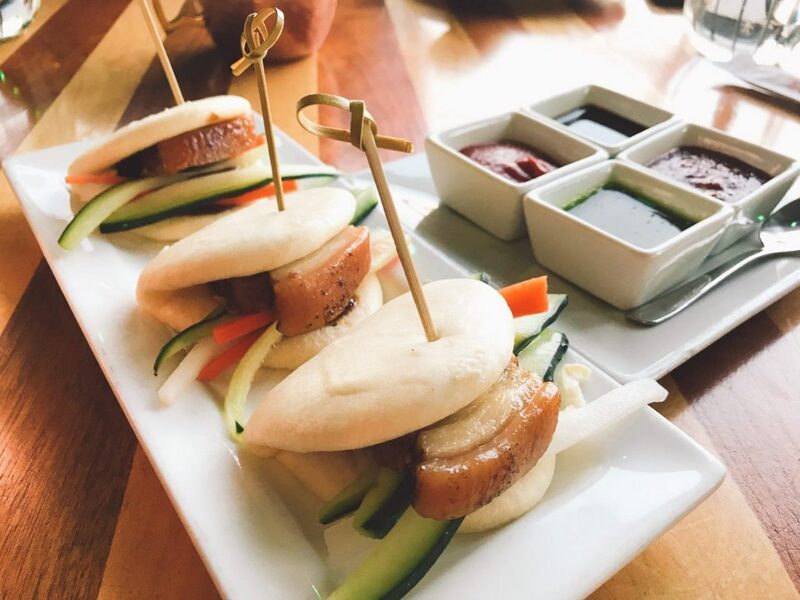 The steamed pork belly buns at Watercress were out of this world, or as they are properly known, Bánh Bao Thit Heo Kho. (The cocktails there were darn tasty as well). We particularly enjoyed our meals at Lulu California Bistro, The Tropicale Restaurant, and Watercress Vietnamese Bistro. All were delicious in their own ways, kid friendly, and a short walk from the Hyatt. 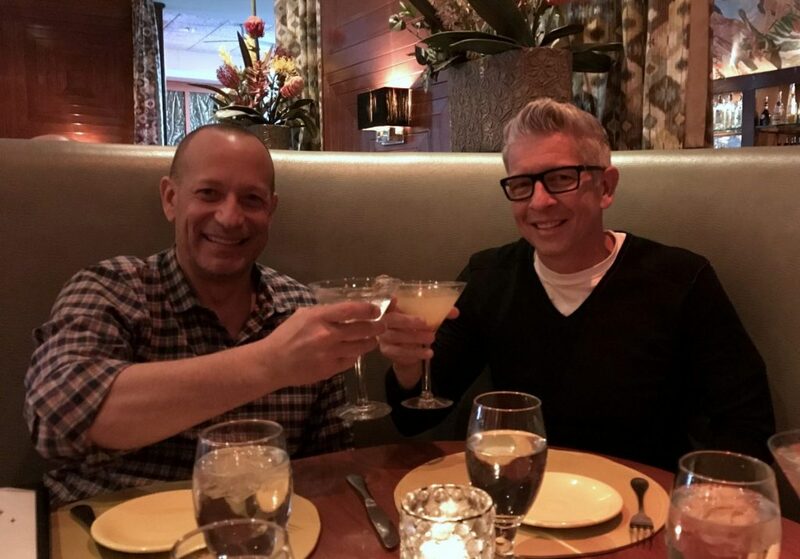 Toasting another fun visit to Palm Springs at The Tropicale Restaurant. For decades, East Palm Canyon Drive was the center of it all. Teeming with shops and restaurants, the area has enjoyed a resurgence of interest in the last several years. Now it’s is a vibrant and exciting area for strolling and shopping again. Fashion, art, gifts and mementos can all be perused within a several long and interesting blocks. The sidewalks are even decorating with stars that honor famous people who have lived in Palm Springs. 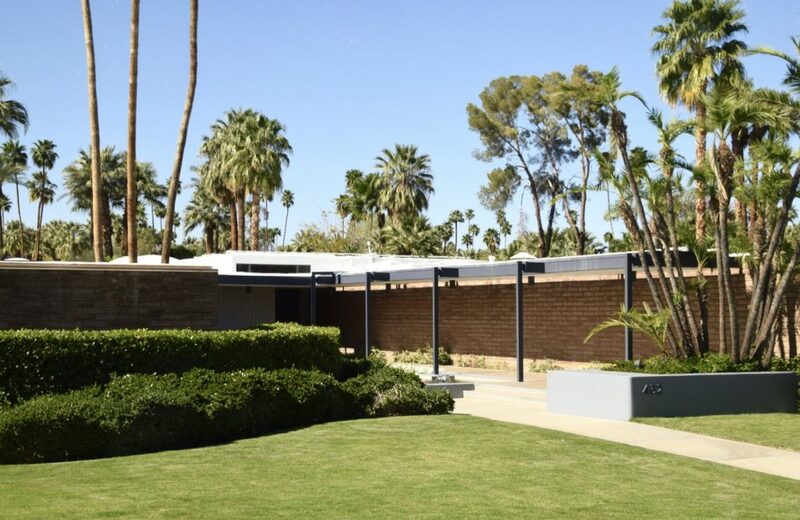 Adding color and fun, the mid-century modern architectural movement is highly celebrated in Palm Springs. There are several galleries and shops downtown that feature decor from that era, now popular again and selling better than ever. Here’s a handy shopping map of Palm Springs to guide you. Some of our favorite shops are Trina Turk/Mr. Turk, Greetings cards and novelty gift shop, and Modern Way mid-century furnishings. Right behind the Hyatt is the new location of the Palm Springs Art Museum. This new building contains a surprisingly great collection of pieces, full of color and story. During our recent visit, the museum was hosting an Andy Warhol exhibit with some of his finest and most famous works. On regular display is a collection of works by such masters as Marc Chagall, Pablo Picasso, Andy Warhol, Roy Lichtenstein, Alexander Calder, Henry Moore, Robert Rauschenberg and Ansel Adams. If the kids have mastered the art of riding a bike, downtown Palm Springs is a safe and easy place for a cruise. Bike rentals can be reserved at several places, and the Hyatt even had a collection for free use by guests. Our family has always loved riding along the flat streets in back neighborhoods, in the areas behind the Hyatt against the mountains. Celebrity homes abound in Palm Springs, like this one belonging to Leonardo DiCaprio. Many Hollywood celebrities have owned homes in these areas. Today, bike routes can be planned to ride past the current Palm Springs home of Leonardo DiCaprio. 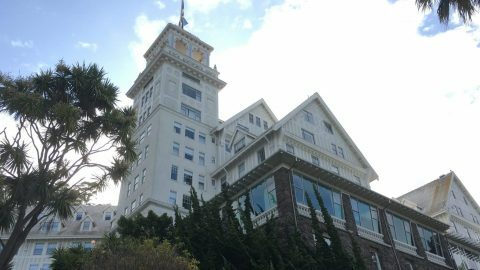 Other celebrity homes easily seen from a bike include the former homes of Elvis Presley, Elizabeth Taylor, Frank Sinatra, Marilyn Monroe and many more. And if you are uninterested in riding a bike (like one of my kids) you can take an air-conditioned tour of movie star homes with Palm Springs Celebrity Tours. They take you to all the hot spots, and even fill you in on the scandals and stories behind the homes. Plus you get to stop for a date shake, which is a Palm Springs specialty. If you haven’t had one, you must! 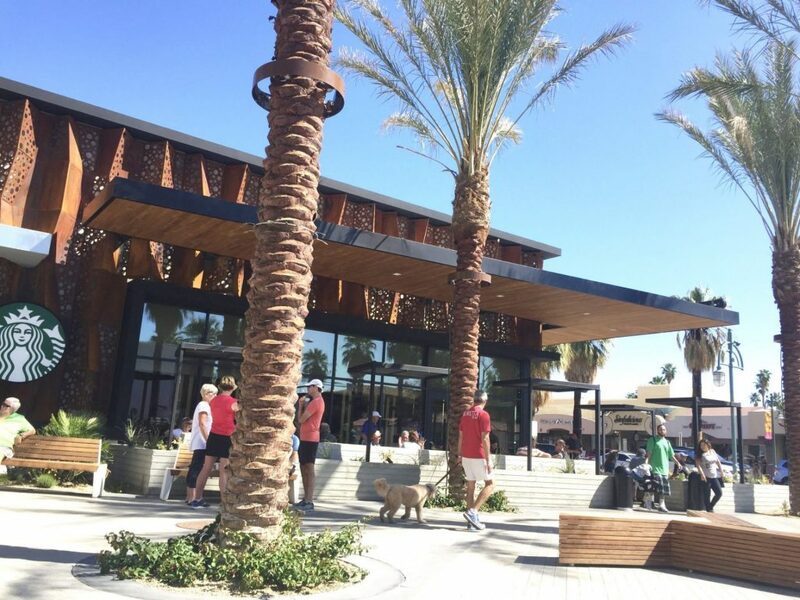 This story is not complete without a shout-out to the gorgeous new Starbucks in downtown Palm Springs. We’ve been in a few Starbucks locations in our travels, and this one takes the prize. The architectural design is significant in its own right, and it appears that many sustainable elements were used in construction. Fronting on a public plaza, this Starbucks has plenty of seating inside and out. We enjoyed an ice coffee drink outside under the shade of date palms, while watching the world go by. The Starbucks in downtown Palm Springs has got to be the most beautiful one we’ve ever visited. With kids, sometimes these little forays into civilization need to be balanced with pool time. The beauty of staying at a hotel like the Hyatt Palm Springs is that you are steps away from the pool. Several times during our stay, we returned back from shopping or a meal to take a dip. After all, there is nothing like floating on your back in a Palm Springs pool. With the hot sun on your body and the view of purple mountains rising nearby, there is something magic about this place. The pool at Hyatt Palm Springs beckons us on a hot day. We’re already counting the days until our next visit!